Many years ago, the Club was actively involved in exploring a number of mining sites in the Isle of Man. The table below shows just some of these sites and you can click on the links to see more details on this page or a separate page. Sadly, legal problems in the Isle of Man have closed access to all mines for clubs such as ours for the time being. 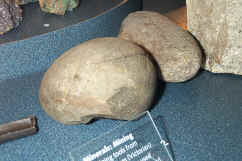 The Isle of Man has been mined since pre-historic time. Mining tools similar to those at Alderley Edge were found at Bradda Head and are now to be found at the museum in Douglas (see photo). Since then, mining has been tried in most parts of the island. There are records of mining in the thirteenth century and lead smelter remains have been found near Ronaldsway dating from the fourteenth or fifteenth centuries. The Stanleys, Earls of Derby, 'ruled' the Isle of Man from 1406 until the eighteenth century and as at Alderley and Parys Mountain, which they also owned, they leased the mines to companies searching for copper and lead. The peak period of mining was between about 1850 and 1890 when lead and then zinc were mined on a large scale at Laxey. The last attempts at mining were at Laxey in the 1930s. After mining closed, some of the evidence was wiped out in the usual way but some has survived and is now protected. 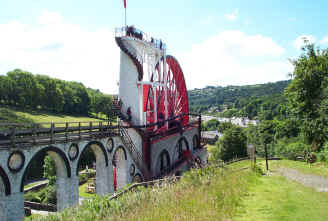 Indeed, the Laxey wheel, the largest surviving water wheel in Europe, was built in 1854 to dewater the mines but has been a tourist attraction since it was built. It is still kept in working order and a short section of adit nearby can be entered by the general public. Geologically, the centre of the Isle of Man is mainly made of mudstones, siltstones and sandstones of the Ordovician period (495 - 443 years ago) but with some Carboniferous rocks to north and south and Permian/Triassic at the extreme north. The north of the island is covered in quaternary deposits (i.e. drift). This page refers to six of the major sites and shows the variety of minerals mined as well as giving an idea of what can still be seen there. Detail is brief as there are references at the end of this page for more information or contact the Laxey Mines Research Group whose website is linked below. The Lady Isabella wheel at Laxey. 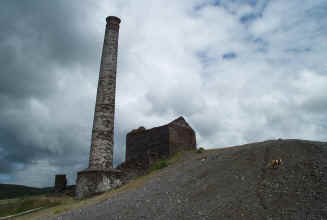 The mines at Laxey were extensive. 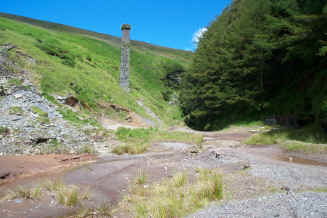 Beckwith's Mine near Foxdale. The chimney really does lean. 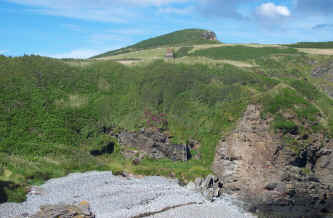 The South Bradda mine at the foot of the cliff. 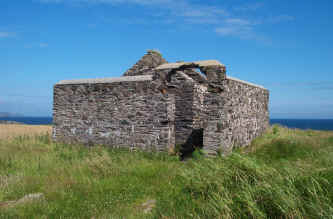 The roofless powder store at Langness Point. 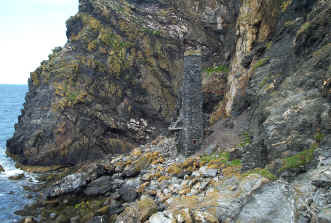 The adit to the iron mine on the shore at Maughold. The adit is the dark patch left of centre just above the shingle. The best reference is "Industrial Archaeology of the Isle of Man" by T.A. Bawden, L.S. Garrad, J.K. Qualtrough and J.W. Scatchard which was published in1972 by David and Charles. No longer in print, it can be obtained from public libraries: ISBN 7153 5440 X.
Manx National Heritage published a booklet "Industrial Archaeology of the Isle of Man" in 1993 and this is sold on the island. It contains a summary of the text in the reference above plus plenty of pictures and copies of the maps: ISBN 873120 07 9. The Manx Experience, The Manx Museum and the National Trust jointly publish a guide booklet on "Lady Isabella and the Great Laxey Mine" which is informative and contains underground pictures and plans. I cannot tell when this was first published but it has been reprinted as recently as 1999. No ISBN. If geology is your interest, you can try a booklet published by the British Geological Survey in 2001 called "Isle of Man, foundations of a landscape" which covers mining as well as general geology: ISBN 0 85272 396 2. To read the last three of these, you will need to be a club member or ask for a copy to be e-mailed (all are in PDF format). There is a lot more information available on the Laxey Mines Research Group site.